"The chalet Matterhorn is a cosy chalet with exceptional mountain views across the valley. There is a free mini-bus service to and from the slopes, making it a good choice if you want good value but don’t like walking to the slopes with your skis. Best of all, if you feeling like a bit of luxury after a hard days skiing, the chalet has an outdoor hot tub on the balcony." The eight bedrooms open off one central landing, and all have their own private en suite shower, wc (All bathrooms were redone in 2014!) and balcony. The comfortable and attractive open-plan living/dining-room sets the scene for a convivial chalet atmosphere. Skiers will delight in the chalet’s own sauna, where tired muscles can be gently eased, before sinking into the hot-tub on the terrace to complete the après-ski relaxation regime! 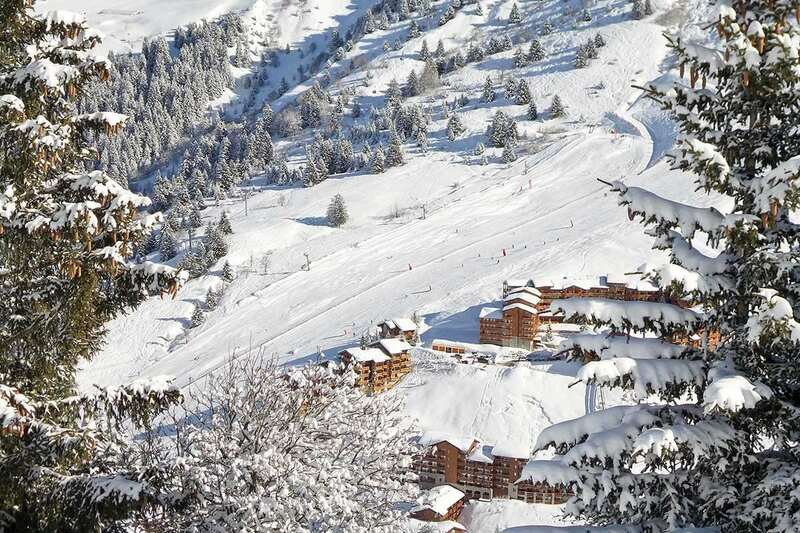 Méribel Centre and the pistes and ski-lifts are approximately 10 minutes’ walk away. Brand new bathrooms throughout for 2014! Rooms 5, 6, 7 & 8 are split level, with the shower/wc on the lower level and steep stairs to single beds on a mezzanine level partially under the eaves. * On your Host’s days off each week, they will leave a simpler continental breakfast out for you to help yourselves, there is no afternoon tea on these days, and you can dine out locally in the evening. Your Resort Representative will gladly help out with information and make a reservation for you if you wish. We are just back from a fantastic week in Meribel. Stayed at the the Chalet Matterhorn in Meribel itself. Great chalet with the twins Becky and Grace acting as our hosts. The food they produced from breakfast through to cake in the afternoon and the evening meals was fantastic. Plenty of it and very tasty. My party filled the whole 16 places in the chalet and that was a real bonus for us. I could not fault the support staff either from the rep Joe who was always on hand to discuss anything and provide info for us. The drivers who would pick you up outside teh chalet between 8.30 and 9.30 and shuttle you to the main lifts and then between 4.30 and 6 shuttle you back. A great service and we only had to wait 10 mins for a van to turn up. We had 2 full days of snow that menat the resort was only open tohalf way up the mountains due to avalanche risk. However the other days we used the 3 valleys pass and went to Val Thoren and Courchevel. You can not cover the whole are in a week as tere are so many runs. The resort was lively at night for those that wante it but Chalet Matterhorn is far enough away from the center ( 20 mins walk) that we had no disturbance. We would deffo vist the area again and the chalet. We had the whole of Chalet Matterhorn booked from Sunday March 17th to Sunday March 24th 2013. What a great holiday !!! The chalet was absolutely superb! I have done a few chalet holidays before, but this was by far the best ever. The chalet was immaculately kept clean and tidy - even though we were a rather rowdy group consisting of 11 adults and 4 kids. The jacuzzi was clean on hot and the rooms and facilities were absolutely immaculate. Our hostesses Hattie and Brynoy were astounding - always friendly, ready to help with no matter what and the meals were fantastic. Hattie and Brynoy went out of their way to make things comfortable and enjoyable (even though we managed to make a bit of a mess of Hattie's pride and joy floor !!! ;-) ). Our ski-rep Dom was amazing - extremely helpful, well informed and once again, delivered a service that was second to none. I really recommend this Chalet and Igluski to anyone who wants to have a wonderful snow-holiday. The whole group was absolutely impressed with the level of cleanliness, service, spontaneity, professionalism, friendliness and awesome cooking we experienced. I would also like to add that the photos posted on the websites do not do justice to the chalet. I have read quite a few of the reviews written prior to our holiday and cannot agree with any of the negative comments made. There is ample seating space (grab dining chairs if you want to sit by the wood fire if the lounge seat space is occupied). In the end, you normally get what you paid for. We experienced that we got a lot more than what we expected for the price that we paid. The shuttle service provided from the chalet to the slopes and back is a huge plus point. The local free bus service also runs quite regularly (check the times though!!!!!!) and drops you off a stone-throw away from the chalet (about a 300 yard walk). Chalet is well situated (5 minute walk into the main village if you wear comfy shoes), but just far enough so that you are not exposed to rowdy apres skiers returning home in the early hours of the mornings. I can carry on and on about the great holiday and service provided to us, but I think the above should be enough to convince the reader to really consider this as a family holiday chalet and resort.